We all have watches in our wardrobes to let us know the time. But hunting watches are much more than time telling devices. They make the hunting sessions easier with the overloaded features they come packed with. The general watches people own aren’t resistant to all types of climatic conditions but the hunting watches are much more strong and resistant as compared to the general watches. Apart from being strong, these watches are also stylish when worn. This article will help you pick the best hunting watch this season. 1 What Are Hunting Watches? Hunting watches are designed to make your hunting sessions easy and full of excitement. Once you get accustomed to the unique features of these hunting watches you will never be able to use any other watch ever. These watches are more of an addiction with their extremely brilliant features. The hunting watches are packed with features and these features are just a few button clicks away keeping the entire concentration of the hunter on his/her target. These watches are way more durable as compared to other normal watches as these are designed for rough use and this feature makes them more apt for hunting sessions in the fields or jungles. 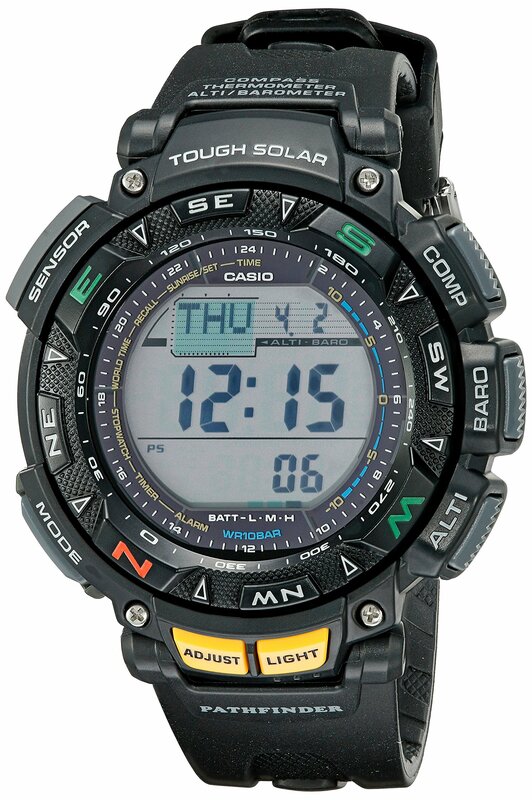 These hunting watches assist with navigation and are composed of solar batteries. These easily wearable watches can be used in varying climatic conditions. These are waterproof and can even be used while dealing with moisture or water. Therefore, even if you are out to hunt fishes you can easily fasten these watches and enjoy the features. The belt of these watches is made up of a strong durable material called resin with a buckle that imparts a firm grip on the user’s wrist. These watches possess an inbuilt stopwatch in case the user requires it anytime. The watches are capable of measuring the temperature of the environment as they have an inbuilt thermometer installed within. But you must be cautious enough to remove the watch away from your body to detect the correct temperature. As the watch might end up detecting your body’s temperature. Many models of these watches work on batteries that can be changed once discharged. Numerous alarms can be set to keep you updated on the important events. These hunting watches have inbuilt lighting feature where the digits are displayed in bright light with a different light in the background. This feature enables the user to make the most of it even during pitch dark nights. The watches when operated via buttons make tones that seem extremely alluring. Although almost all the hunting watches are packed with numerous features you must minutely go through all the features to well understand these hunting watches such that you can pick one as per your use and convenience along with a handsome design to impart you that stylish look you’ve always been craving for. These hunting watches are perfect to be used in different environments and are packed with amazing features in a strong, durable body. Along with amazing features, these are very stylish and fashionable. 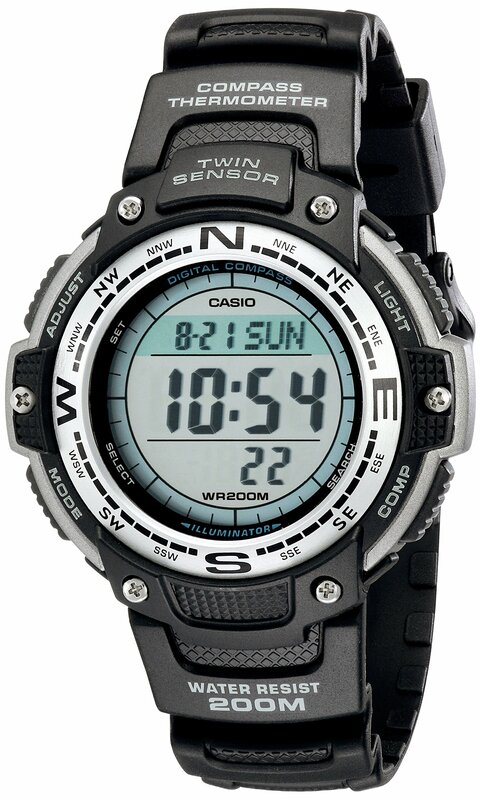 This Casio twin sensor watch is capable of detecting the temperature of the place that helps the user to stay updated with the weather conditions. The diameter of the watch is approximately one and a half inches that look classy and stylish on the wrist. The watch has a built-in compass that enables you to know the directions easily. The compass stays on for about sixty seconds. Accompanied with a stopwatch to allow you to measure the exact timing along with seconds as and when required. It displays time in 24/12 hour format with a calendar that is auto updated. As and when the buttons on the watch are operated it makes a tiny tone while switching it on or off. It can be easily used in the dark as the digits are viewed in a bright green color with a lighter shade color of the background. The watch enables the user to detect the temperature of the place but to know the exact temperature you must remove the watch from your wrist and keep it aside for a while or else the watch may detect the body temperature instead. As the watch works on the battery you might have to replace it once it is consumed to continue using it. The alarm built in is not loud enough. With special features like the ability to measure altitude, temperature, direction as well as time these watches are an amazing purchase if you involve into wildlife activities like hunting. Can be used in the dark due to the digits being displayed in bright light with a background light. Even has an altimeter and a barometer installed to add on to the amazing features. Displays time in 12/24 hour format and displays the code of the city you travel in. The band of the watch is made up of resin with a buckle provided to firmly tie it to the wrist. The watch is a unique design made up of stainless with a case of size 51 mm along with mineral dial. The battery gives a life of around six months when completely charged. Comes with an amazing feature of being waterproof. Can be used in a depth of around 300 ft. and can be worn while swimming or other activities involving water. This watch is full of features like an auto calendar, an indicator to let you know about the battery life, power saving mode, a digital compass etc. Keeps you updated with the temperature of your surroundings as it has an installed thermometer and is even resistant to low temperatures. Let’s you set five alarms a day to keep you reminded of the important events. Although the product is waterproof but it cannot be used under water beyond 300 ft. Hence, you cannot use it while getting involved in activities like scuba diving. 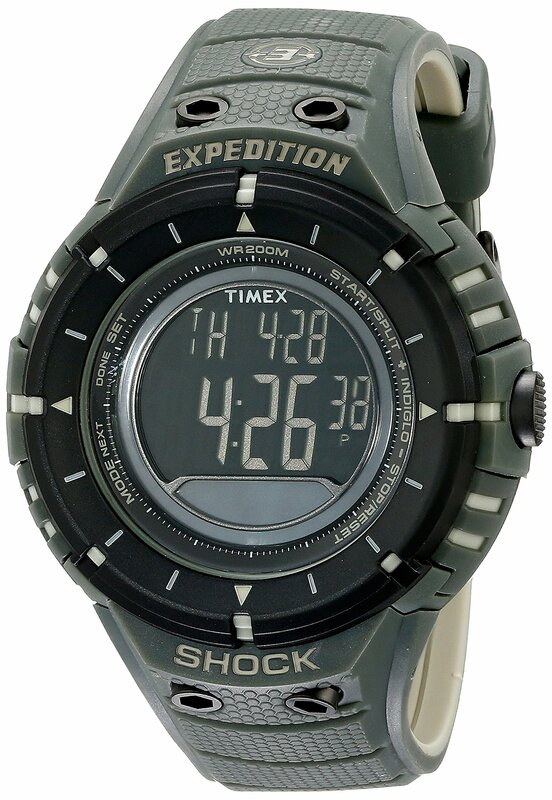 These Timex hunting watches are one of the best watches to excellently assist you while hunting. These are loaded with innumerable features that impart stress-free hunting sessions. You can easily use it in the dark as these come with Indiglo light for easy viewing. These watches are waterproof up to a depth of 200 meters as well as resistant to shocks. The watch case is extremely light such that the user feels no weight on the wrist. A watch good enough to use while your wildlife hunting excursions as these are fitted with a compass to let us know the directions with accuracy. Inbuilt calendar and time display in 12/24 format as per your convenience. The resin band tends to break post sometime if you use it roughly. Stops working at depths below 200 meters in water. Not fit for buyers looking to purchase a watch for larger wrists. Hunting in itself is a huge task to carry out and if you pick the best hunting watch for yourself you might reduce the tediousness of your hunting excursion immensely. These hunting watches offer much more than just displaying the time. You can keep a check of temperature, altitude, direction as well as the city you travel in. To pick one for the use you can go through the above-reviewed hunting watches and finalize one as per your use.